Register for an account or login here. We use Amember to run our affiliate program and to handle checkout for all our products. This is a safe and secure system that’s easy to use and understand. If you ever have questions about it do not hesitate to contact us anytime. As an affiliate of Monthly Content Helpers, you’ll earn 50% on all our products. Your commission is paid out 31 days after the sale has been made complete to account for refunds. 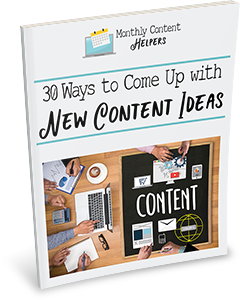 If you work with people who need content for their businesses you can feel good promoting our content to them. If you want extra help such as for us to host a webinar with your audience we can do that. Anything to make it easier for you to ensure that the people who need it find out about Monthly Content Helpers.